I was away for a few days visiting my parents. Since there was no internet there, I had taken my latest project along and did manage to stitch most of it. I've named it Indian Pride - since it is a peacock with its feathers..uhh..flowers ...spread around..
Why am I trying to explain? Why don't you see it for yourself? 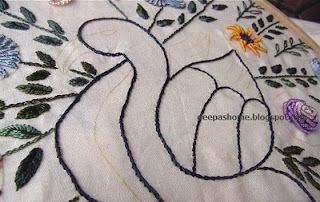 Here he comes...concept and idea of yours truly,here is a design that would teach you the basics of brazilian embroidery with 13 flowers,4 types of leaves and all the basic stitches...taaadadaa.. This is the design I've planned for the participants of my one day class on July 3rd in Bangalore.I've also included it in my Brazilian embroidery beginner's online course which I plan to start through a private blog. Click on the picture for a better view. Now for the suggestion part - do you see an incomplete outline in the pic above? I've shown it with an arrow in the previous picture. 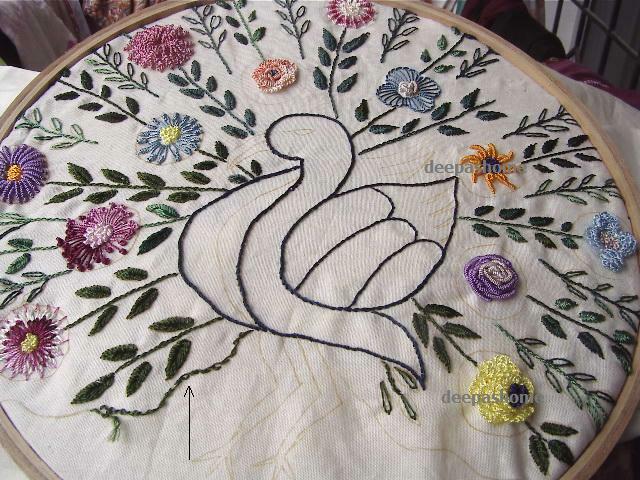 That is the outline of the feathers.It encircles the entire set of flowers. I started with green,but Iam not too happy with it. What color do you think I should use there? How about yellow? What about the beak ? Please leave your suggestions - I really need them to complete this fellow. And finally,regarding the design - do you think this is good enough? 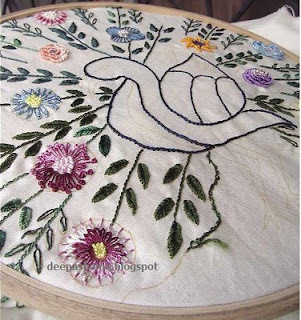 Last time when I conducted the class ,I had prepared this messy little sampler since it was getting too expensive getting the design as well as threads from abroad. Everyone wanted a design to work on and I couldn't provide that. Well, this time I tried on my own since the financial issues remain the same. Iam no designer. I hope this one passes the test.What do you think? 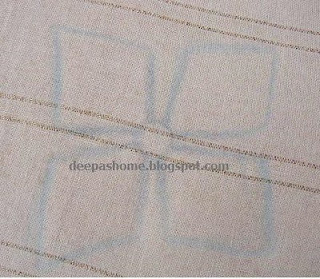 Deepa, the design is very nice. I think u can use the same colour, the colour u have used for peacock. Deepa, I think this is a lovely design and would be perfect for your class... it is simple yet has enough stitches for them to learn... it is also more unique than a wreath, etc.,. A suggestion for colour... how about a nice teal or turquoise or variegated versions of those colours if you have one for the line encircling the design, that will bring in some of the actual colour of a peacock, and I would suggest yellow for the beak, again, a more realistic colour of a peacock... hope that helps. hope you had a nice time with your patents. wish I could attend the classes..let me see how my luck works this time..
And I wish you all the best for your classes. I think honey brown or peacock blue will do for the feathers..
your work has always been a great inspiration! 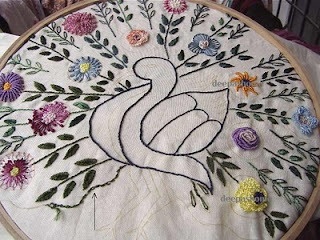 This is just so close to what I am looking to embroider, although as a crossstitch... well, still looking for that elusive design, but yours looks fantastic!! The work is fantastic and very inspiring too. I think bright blue will be good for the feathers and a slight yellow (like our kitchen methi) color for the beak. If I am not travelling, then I will opt to attend the classes. I will let u know by 10th June. Happen to stumble on your blog while browsing. I am going to bookmark this blog. You are very talented. Very beautiful design. I wish I could be there in India to attend these classes. I'm far from an experienced embroiderer, but I think the green you have chosen is fine. If you have an iridescent green, or perhaps a mix of a light and darker green (or gray green), that's what I might use as an alternative if you don't like what you have. Great work Deepa. Lovely seeing all that you have done. Thanks for sharing.